These days, many remodels are going with the aesthetic of ultramodern new construction: angular, minimalist, almost industrial. But Lisa Cole and her husband, David, who live in a charming 1923 Craftsman bungalow on Queen Anne, have chosen the opposite approach, remodeling with a bold mix of patterns and attention to stylish original details. The main level of the home has been restored in stages over the years, a combined effort between Cole, architect Brandon Skinner and contractor Kevin Astle, Cole’s younger brother. Astle is an artist, and details (such as the thick black window frames that give the kitchen a Parisian bistro feel) bear a resemblance to his black-on-white paintings. That synthesis is most evident in the bathroom, an ultraluxe respite that’s at once an old Hollywood-style nod to the home’s era and a reflection of Cole’s love of classic French aesthetic. It’s the house’s pièce de résistance. As a fashion blogger and writer, Cole has an eye for style. She found inspiration for the bathroom in an online photo from Martha Stewart Living magazine. 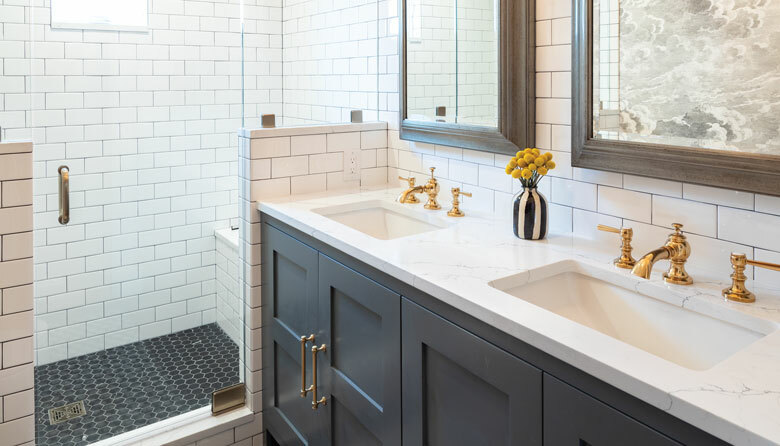 Though she hand-selected the substantial gray medicine cabinets, white quartz countertop and brass fixtures, she says architect Skinner immediately understood her vision for the overall space. She also credits him for being instrumental in the floor design, which utilizes multiple shapes and sizes of tile, from simple black subway to stunning Ann Sacks hexagons. A series of last-minute decisions took the bathroom’s look from glamorous to downright opulent. Cole says she was in Portland when she found a crystal wedding cake chandelier at Urbanite and knew it would be the perfect touch to add both light and detail. The wallpaper—a stormy affair that reads like line drawings—was found by Cole at Maison Luxe; although its busyness had the potential to push this small space over the top, it only adds to the richness. There’s a small black and white vase with a handful of yellow billy balls on the counter; Cole picked up the vase in Paris last summer. “It’s just the icing on the cake,” she says. In a small space with so much coherent detail, she’s absolutely right.